Limpet teeth might be the strongest natural material known to man, a new study has found. Researchers from the University of Portsmouth have discovered that limpets – small aquatic snail-like creatures with conical shells – have teeth with biological structures so strong they could be copied to make cars, boats and planes of the future. 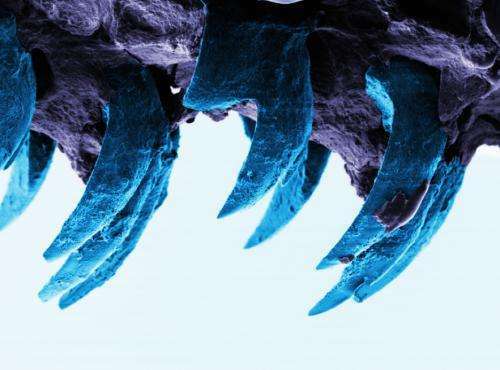 The study examined the small-scale mechanical behaviour of teeth from limpets using atomic force microscopy, a method used to pull apart materials all the way down to the level of the atom. Professor Asa Barber from the University's School of Engineering led the study. He said: "Nature is a wonderful source of inspiration for structures that have excellent mechanical properties. All the things we observe around us, such as trees, the shells of sea creatures and the limpet teeth studied in this work, have evolved to be effective at what they do. "Until now we thought that spider silk was the strongest biological material because of its super-strength and potential applications in everything from bullet-proof vests to computer electronics but now we have discovered that limpet teeth exhibit a strength that is potentially higher." Professor Barber found that the teeth contain a hard mineral known as goethite, which forms in the limpet as it grows. He said: "Limpets need high strength teeth to rasp over rock surfaces and remove algae for feeding when the tide is in. We discovered that the fibres of goethite are just the right size to make up a resilient composite structure. 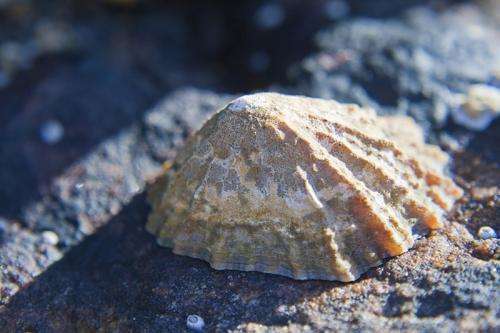 "This discovery means that the fibrous structures found in limpet teeth could be mimicked and used in high-performance engineering applications such as Formula 1 racing cars, the hulls of boats and aircraft structures. "Engineers are always interested in making these structures stronger to improve their performance or lighter so they use less material." The research also discovered that limpet teeth are the same strength no matter what the size. "Generally a big structure has lots of flaws and can break more easily than a smaller structure, which has fewer flaws and is stronger. The problem is that most structures have to be fairly big so they're weaker than we would like. Limpet teeth break this rule as their strength is the same no matter what the size." The material Professor Barber tested was almost 100 times thinner than the diameter of a human hair so the techniques used to break such a sample have only just been developed. He said: "The testing methods were important as we needed to break the limpet tooth. The whole tooth is slightly less than a millimetre long but is curved, so the strength is dependent on both the shape of the tooth and the material. We wanted to understand the material strength only so we had to cut out a smaller volume of material out of the curved tooth structure." Finding out about effective designs in nature and then making structures based on these designs is known as 'bioinspiration'. Professor Barber said: "Biology is a great source of inspiration when designing new structures but with so many biological structures to consider, it can take time to discover which may be useful." The research was published today in the Royal Society journal Interface. What is the definition of "strength" as used in this article? I think of spider silk as having tensile strength. Is that the same as the hardness of goethite? Is it harder than diamond? or by nature do we restrict ourselves to living organisms? The term "strength" apparently means resistivity to some loading force. Tensile means "capable of being drawn out or stretched."